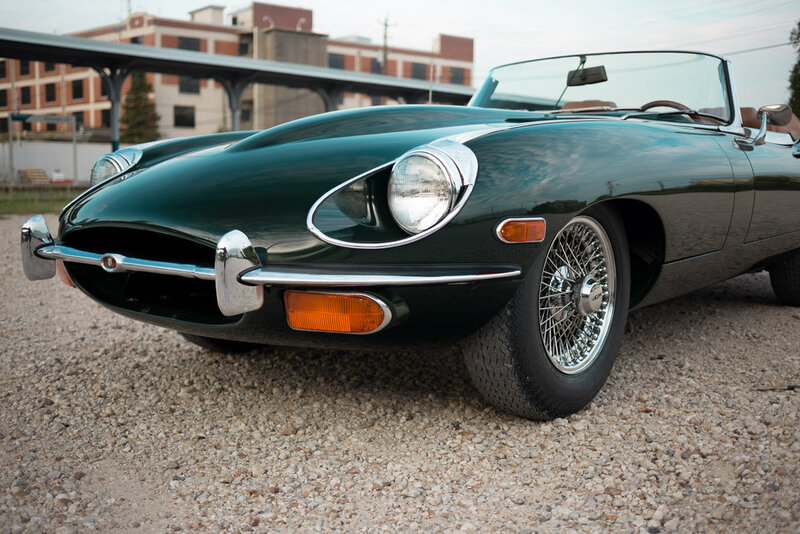 The E-Type persisted in production for 15 years, gradually becoming larger, heavier, and less “sporting”. 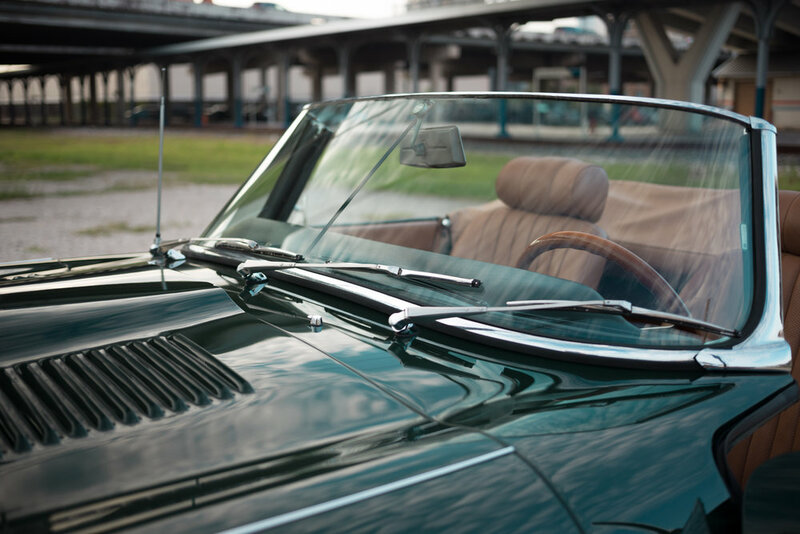 While the original Series 1 cars are generally considered the most beautiful, the series 2 cars produced from 1969-1971 have much to recommend, and in many respects are the “better” car. 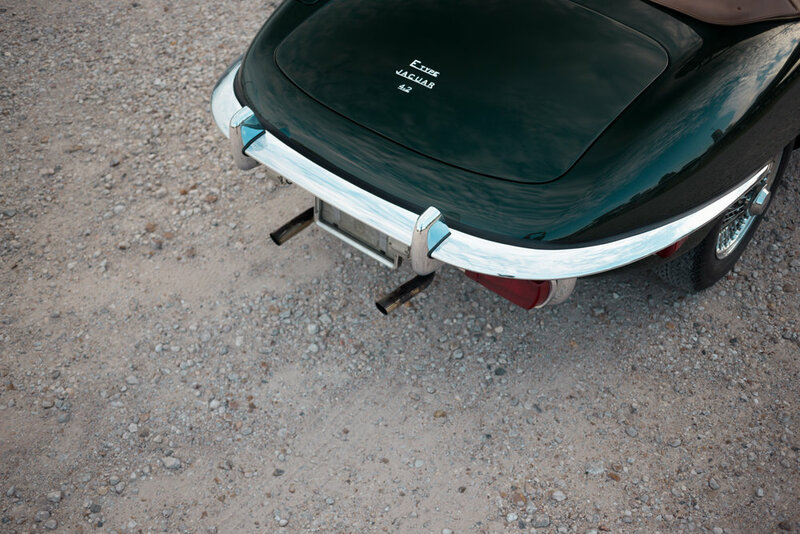 The overheating problems of the earlier cars was solved, air conditioning became available (albeit rare to find), seat designs were more comfortable, and countless mechanical improvements made the E-Type more reliable and usable than ever. 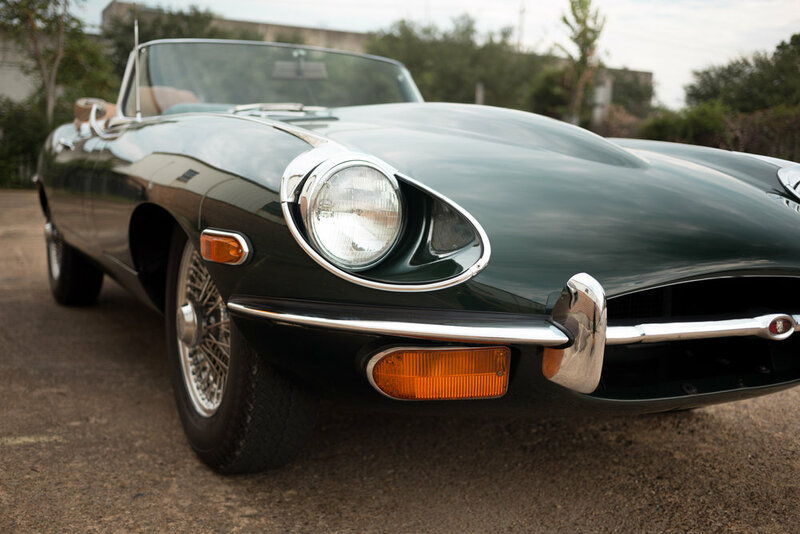 This particular 1970 E-Type is a very special car. 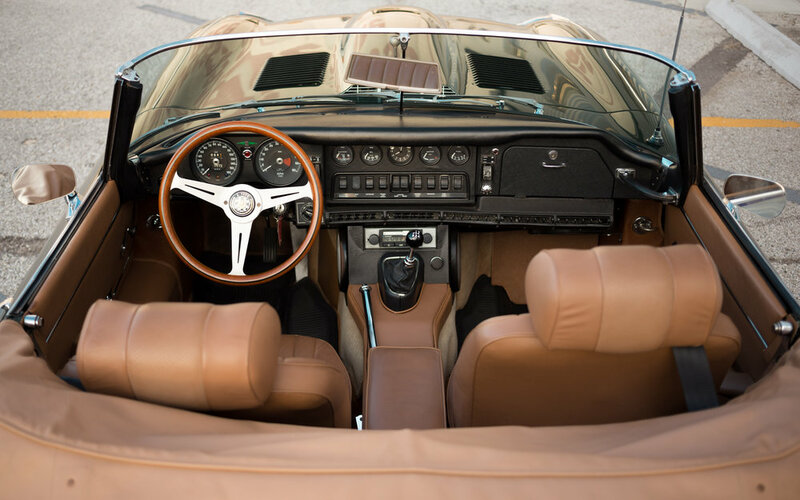 While its earliest history is unknown, records from the early 1980s all the way to 2014 show that it was owned by a single owner who clearly loved and cared for the car. 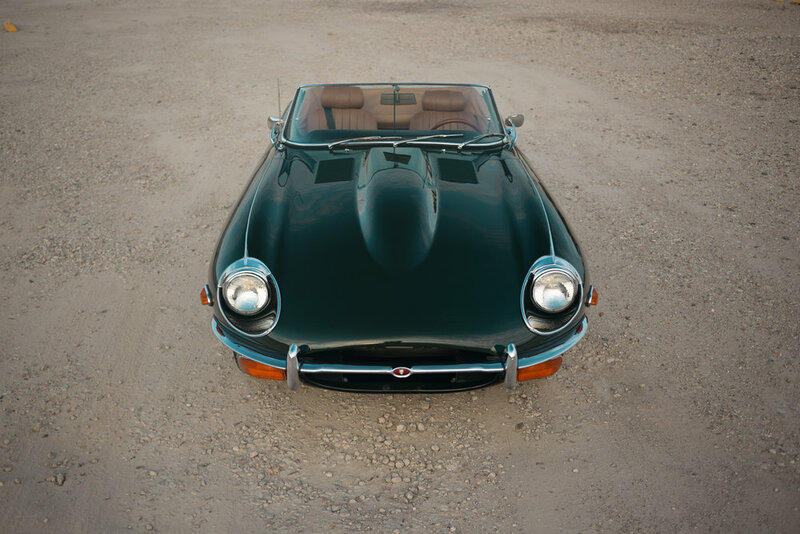 In the mid-2000s, he decided that the car was due for a restoration, as almost all 40-year-old cars are by that point, so he had the car stripped down to the bare shell for a full major restoration. 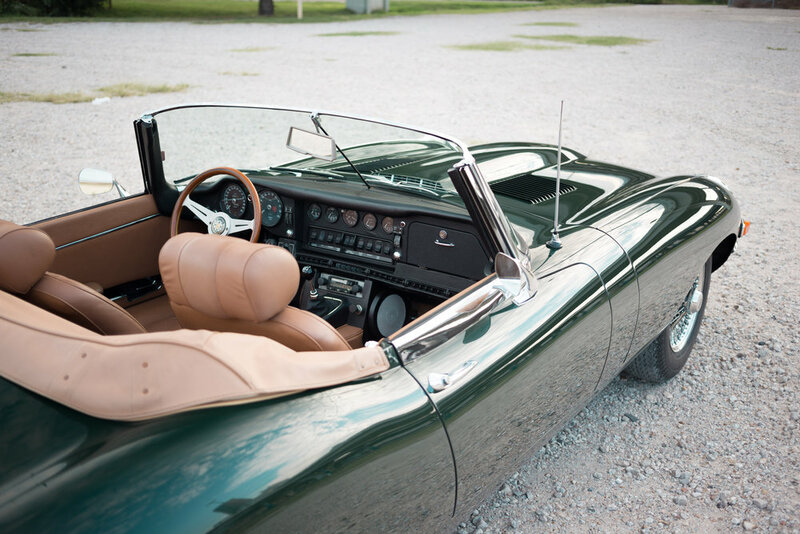 Pictures show that the original color of the car was the lighter Willow Green, but the owner chose to repaint in the much more iconic British Racing Green. At the same time, all of the mechanicals were refurbished or replaced as necessary. The engine was stripped down to the bare block and completely rebuilt. Suspension components, brakes, gearbox, drivetrain… everything was addressed. 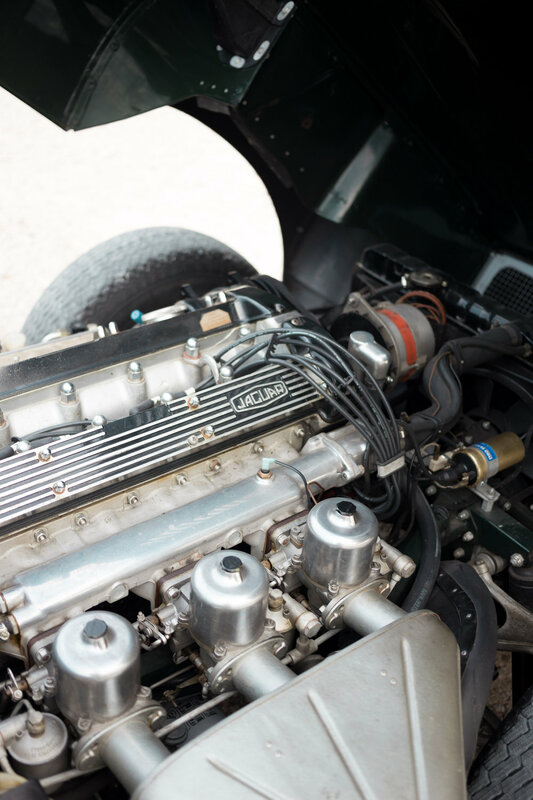 Some very minor mechanical improvements were made at this time, specifically replacing the original emissions-choked Zenith Stromberg carburetors with triple SU carbs, along with a matching intake manifold. (The original carbs and manifold, as well as other minor replaced parts, are present and included in the sale.) Pictures of the restoration process are present and show the progress in detail. The shop that did the restoration must have known what they were doing, because the final result is just spectacular. 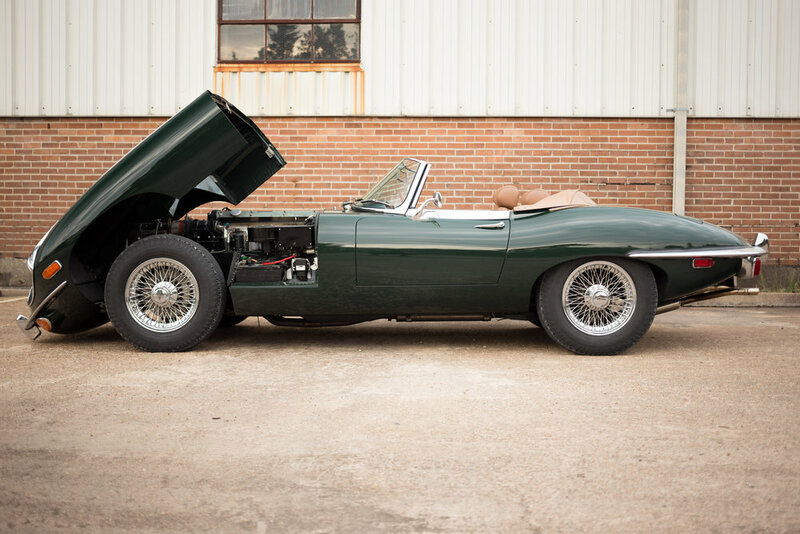 And, unlike many cars that have been “taken apart and put back together”, this particular E-Type feels as tight as a new car. There are no rattles, no shakes, and everything works. The car drives utterly beautifully: the torque of the straight-6 engine pulls strongly to redline and sounds amazing while doing so, thanks to those triple SUs. The gearshift is tight and precise, the suspension is sporting yet supple, and the brakes feel like a modern car. In the interior, while the seats, carpeting, and other trim were replaced, much of the well-preserved original remains. 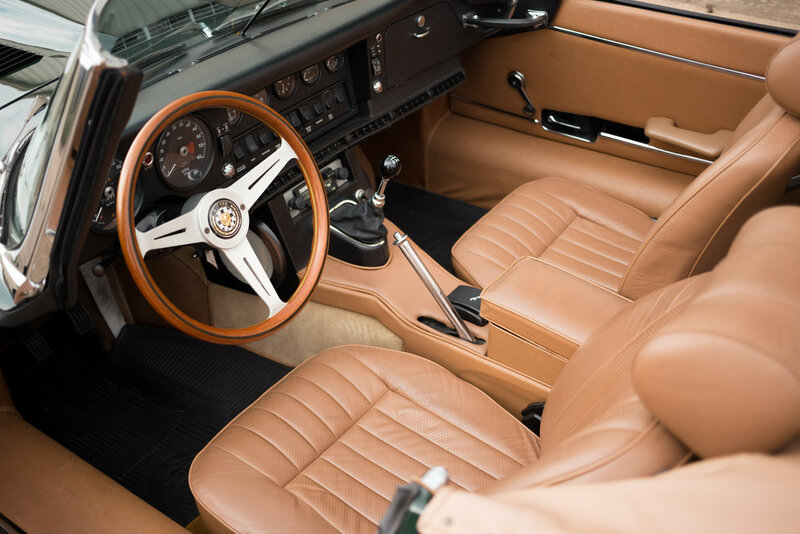 The original steering wheel was replaced with a period-correct Nardi wheel, but the original wheel is present and included in the sale. Everything works, including the often-nonfunctional clock in the dash. The very rare optional air conditioning blows cold. The gauges show a happy engine with healthy oil pressure and right-down-the-middle coolant temperature. 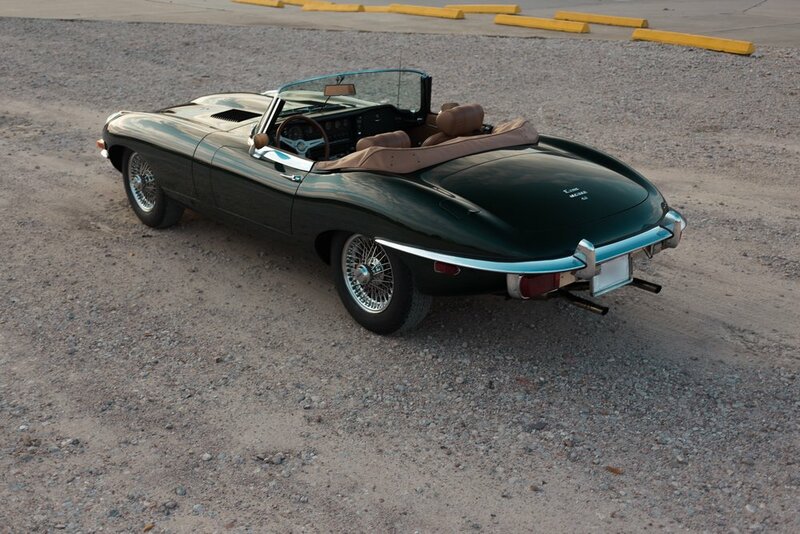 And, finally, this E-Type comes with its very rare and desirable factory hardtop, painted in the body color. The original books and manuals are present, as well as the wheel removal tool, hammer, spare, and tool pouch. 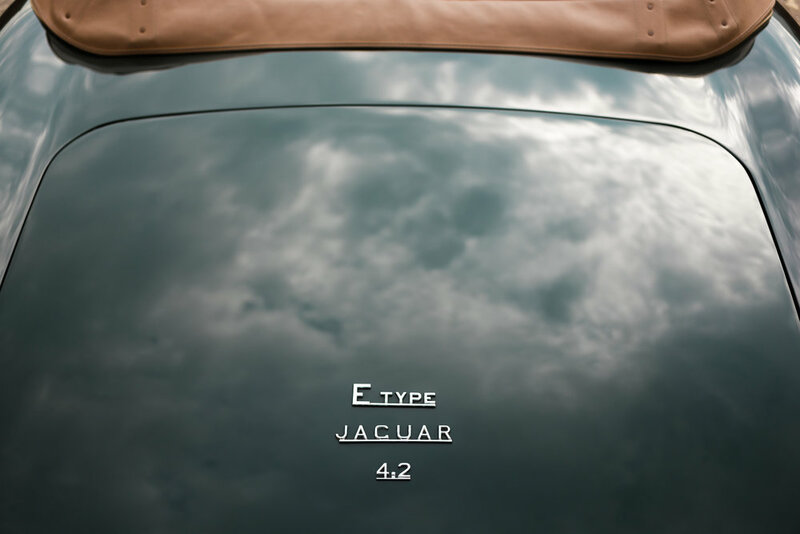 E-Types have appreciated dramatically in the recent past, but the Series 2 has not moved in value as quickly as the earlier Series 1 cars. In reality, the Series 2 cars are arguably nicer to drive and more reliable than the earlier cars, and should not be overlooked by an astute collector who desires a car that not only can be an important part of a collection, with the potential for value appreciation, but one that can also be driven regularly as well. 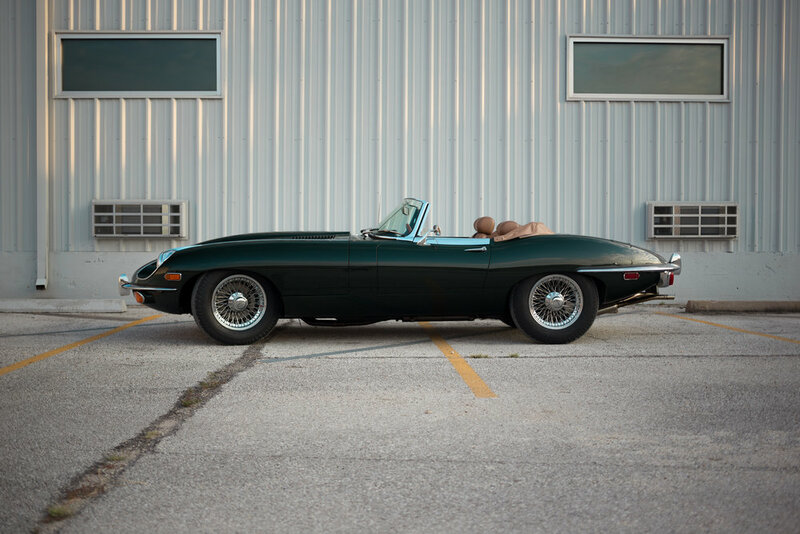 And, an E-Type roadster that has had a quality full restoration, that is fully sorted, in the perfect color combination, is an opportunity not to be missed. Pre-purchase inspections are welcomed and encouraged, and I look forward to discussing this fine motorcar with you. Please contact Michael Foertsch at michael@mbrandonmotorcars.com or 832-617-0494.